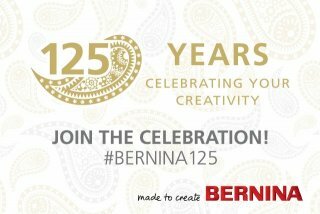 An authorized BERNINA Dealer We are Colorado Springs' only independent authorized BERNINA Dealer and Full-Service sewing center. 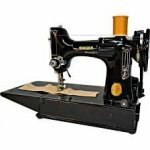 We also offer sewing machine service. For the latest newsletter information see our "What's New" web page.You always get the newest HCQ class and "What's New" information. We hope you are enjoying having the HCQ-World news at your fingertips! Then you'll be able to view the latest edition of the E-Newsletter anytime that is convenient for YOU! 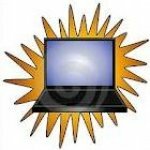 Please e-mail or call us to order directly from our abundant shop inventory if you don't see what you want in our web catalog--we probably have the items you're looking for. click the blue butterfly, and shop at EDS for great Embroidery designs. Keep your BERNINA in tip top shape with tips from Kurt! Do you love your featherweight? In this class Gary will teach you the ins and outs of featherweight care as well as a little history about these best loved wonders. Learn the ins and outs of rulerwork as you create a sampler using the blocks you've created. Ih you love the idea of quilting with rulers, don't miss your chance to get some great hands on experience. BERNINA workbooks are located here. The information and stitching exercises in this class address the special features, functions, & techniques you can sew with the BERNINA 590, 790 and the 8 Series models. Create a fun fabric book to showcase stitched techniques using various BERNINA presser feet and accessories. Bring thread and some fun embellishments. 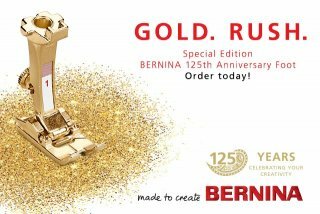 Whether or not you have already created your first Foot Book, you will have fun creating a fun fabric book or additional pages for your existing book using the one-of-a-kind BERNINA presser feet and accessories. This 12-session class can be taken by Foot Book graduates, as well as those wanting to take Foot book and Foot Book 2 at the same time. Solve the mystery on Stabilizers, Needles and Threads in this lecture only class. This class covers a variety of techniques used to quilt. Learn to master your BSR as well as some of the other feet Bernina offers. Explore different aspects of your software in a fun and friendly environment. This club is a great way to meet wonderful people who love hand embroidery just like you! Come relax, stitch and enjoy the fellowship of this fun class! This 8 month Block of the month designed by Chris Hoover features the Graphite batik collection from Timeless Treasures. The Graphite collection has a modern neutral palette ranging from light cloud grey to deep charcoal grey. Quilt finishes at 64" x 81" ( Kits for Queen and King sizes are also available). In this 10 session Block of the Month, join Linda as you create a darling quilt that focuses on home and family and the values that keep us close. Kit includes fabric for quilt top and binding! Quilt finishes at 65" x 65". 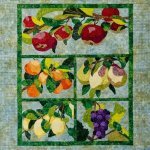 This 6-session orchard themed Block of the Month uses a unique applique technique or a beautifully finished project. No fusible web required! Quilt finishes at 61" X 71". P.S...the quilt designer, Barbara Pershing, will make a special appearance to teach Block #1! In this 12 session Block of the month, The Temecula Album Quilt is a beautiful sampler that mimics those of Ohio's Miami Valley in the late nineteenth and early twentieth centuries. The mismatched block sizes, unique applique and wonderful folk-art appearance of these quiltmakers provide the perfect inspiration for this 63" x 70" quilt! Fabric for quilt top and binding included. In this 12-month block of the month by Nancy Gere, the Wisdom Block of the Month pattern includes inspirational quotes and words to live by. Kit includes pattern and over 19.5 yards of fabric to complete the 86" x 98" quilt top and binding. Rulerwork with Donelle McAdams for those who have already taken Beginning class. Volunteer your time to work on quilting projects for children of deployed military parents. The Prairie Women's Sewing Circle Club features historic anecdotal stories about what daily life was like for an "ordinary" Prairie woman, c. 1840-1900, who sewed daily of necessity. Projects are small and use modern day rotary cutting techniques with reproduction fabrics! Back by popular demand is our wool club! And we have some great offerings for you! Join Deb each month to make some small, fun projects. Make a gorgeous quilt while learning the basics of quilt construction. You'll stitch various-sized fused applique blocks using the beautiful decorative machine stitches. Finishing at 85" x 93", this quilt will be a favorite. Cover the different feet available, faux chenille, ruler work, and more! Finish those quilt tops you have worked on. Display your work with pride! In this 8-session continuing education class you will learn to quilt 8 different blocks using more of the Westalee specialty rulers! Come and join the fun. You will receive a special 'graduation gift' at the end of this class. In this 12 Month "internship", you will study all aspects of Machine embroidery from A (applique) to Z (zippers)! Upon graduation you can consider yourself an Embroidery Master! Most kits include all materials except thread. Stabilizer included! In this 10-session class, you will be making a lovely Quilt that is created totally in your embroidery hoop! Using soft, summer colors, this quilt is sure to become a family favorite. 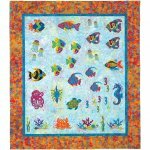 In this 6-session Machine Embroidery Block of the month, you will create beautiful fish by using a luscious batik background and a colorful batik layer cake. Kit includes design disk, fabric for appliques, quilt top and binding. Your ?aquarium? will finish at 27" x 38". 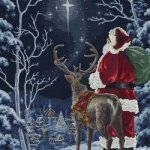 In this 8 session machine Embroidery class, take a minute to reflect with Santa and appreciate the celestial wonders that illuminate his journey. Join him as you endeavor on your own journey, creating this epic holiday tiling scene featuring unbelievable shading and stunning artwork. Includes design disk, batting, fabric for top and binding. Finished quilt is 32"x 40". You are invited to "stroll" down Smith Street as you spend a day at the zoo, or time on the farm. In this 12 session Block of the Moon, you will be quackin' or hissin', depending on which quilt you choose to make Come and enjoy the fun! Kurt will be cleaning your machine in this one day "service while you wait" clinic. BERNINA ACADEMY II 'Tame that technique'! What a bargain! Two full days of sewing fun! Learn how to successfully sew a variety of seaming, hemming, and embellishment techniques to give your projects a professional finish. Discover ways to make sewing easier by using proper feet, stitches, and features of BERNINA machines for precise sewing. Students will be inspired and encouraged to sew as they learn how to successfully work with new techniques made easy with the right tips and tools. It's like a shop hop, but it's not... no fees, no passports and all summer to play! Quilting with rulers opens up your creative side by enabling you to stitch with the guidance of a template. Beautiful results normally achieved only by Longarm quilters can now be yours! Join us for 2 fun filled days as we explore all of the possibilities that rulers offer! Join us for a block party that will include the whole world! You are invited to collect blocks from each of the participating shops. * From these blocks, you will select 12 to create a unique quilt design. You can then submit this design to Northcott for a chance to win a 9-day trip for two to England! While there, you will be treated to a private tour of Stonehenge! This block party takes place from March 15th through September 30th 2019. *Participating shop?s from around the world will have their unique block design available online.